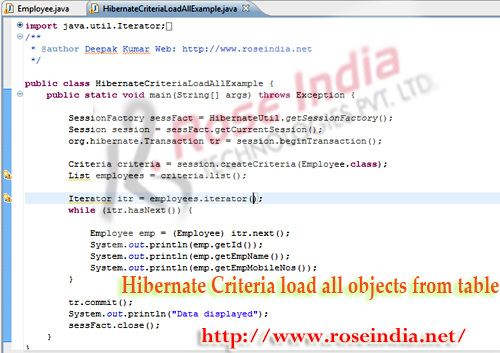 Learn how to get the instance of Criteria and then load all the objects from table in Hibernate program. Hibernate Criteria load all objects from table - Learn how to load all the data from a table (not good choice if large amount of data is present in table). This is the first example of Hibernate Criteria which loads all the data from 'employee' table in our application. In some cases you have to load all the data from a table then you can easily use the Hibernate Criteria load all objects from table. You should use this query with care as in production environment if data is huge it will crash the JVM. Let's discuss about the API of loading all the records. In this above code we creating the instance of Criteria by calling createCriteria() method on session object and passing the Employee.class as parameter. The criteria.list() method returns the list of all the Employee objects. In this section you have learned how to use the Hibernate Criteria Query to fetch all data from a table. Read more Hibernate Criteria Query examples.